When a neighborhood Super Blogger like Kings Road Rocks invites you to join her at a Chelsea hotspot like La Brasserie London, you have rocks in your brains if you decline. 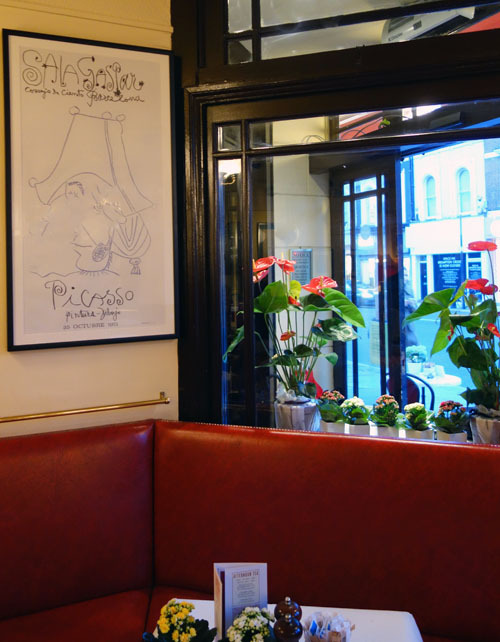 Therefore, I eagerly arrived at La Brasserie London at 4pm on Saturday to meet with both Mina from Kings Road Rocks and Angie from Silver Spoon London. 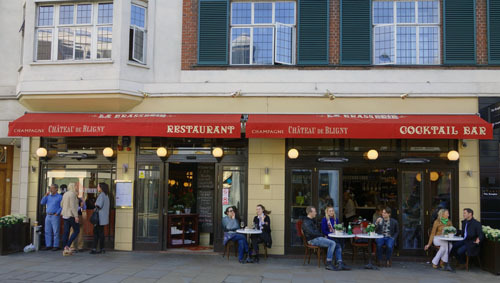 We were seated right near the entrance of London’s first all day Brasserie. 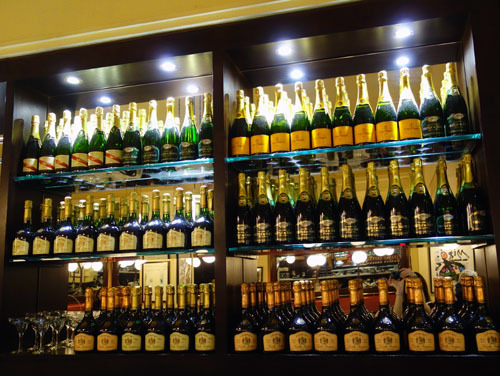 You guessed it, Sunny friends… CHAMPAGNE! 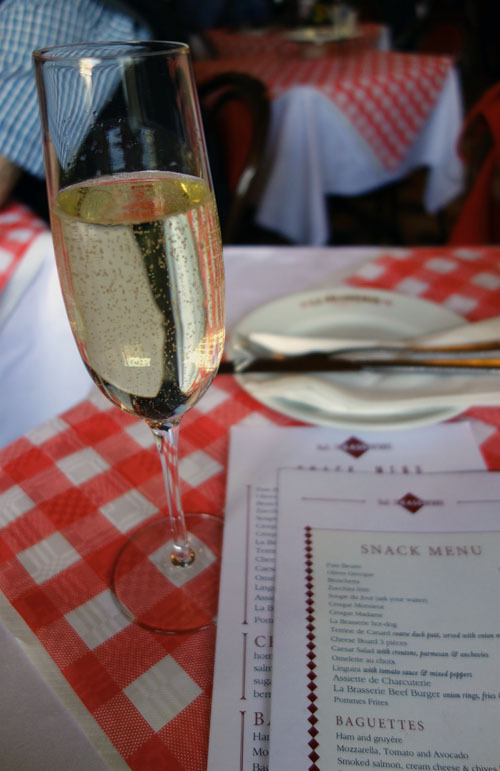 And just as quickly as we were seated, a round of bubbly arrived for us to enjoy. 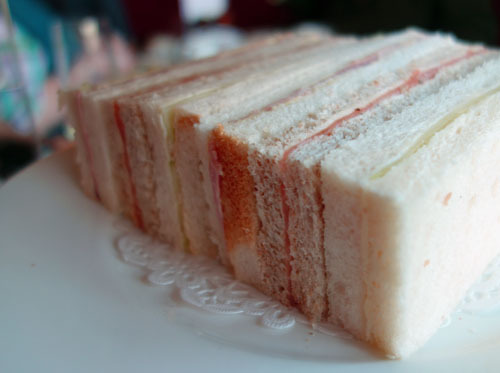 After our initial chats and giggles, we placed our order for their Afternoon Tea, which is 3-tiers of French love, mon ami! The bottom layer features assorted pastries that are perfectly sized for any Chelsea girl who wants to have fun and still zip and button her skinny jeans. 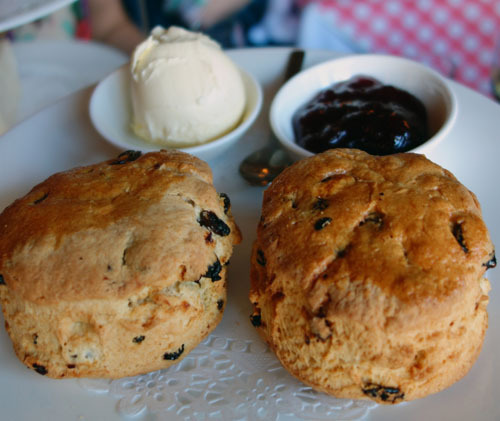 And last (but if you know Sunny, certainly not least)… the SCONES! I tried very hard to be polite and eat slowly, but I just couldn’t help myself with the scones. They were tres tres tres MAGNIFICIENT! As we talked and talked, our bubbles “evaporated”, so we decided to raise the adventure glasses and explore the cocktail menu. I had the Brompton Road (vodka, peach, passion fruit puree, passion fruit syrup, pineapple juice and champagne). Angie sipped on the Made in Chelsea (vodka, fresh blackberries, fresh strawberries, crème mure, passion syrup, and champagne). 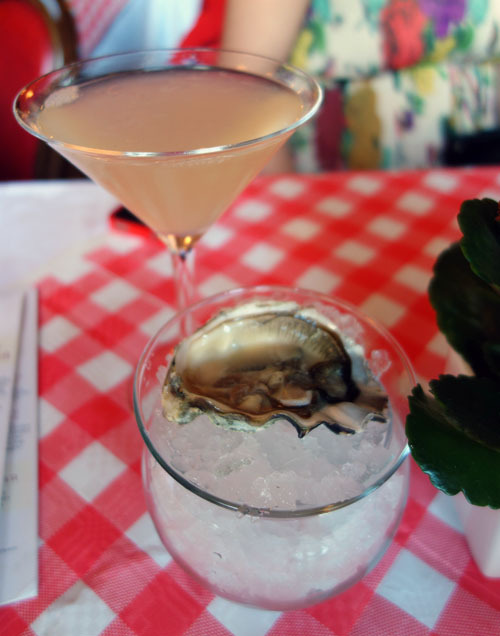 Since Mina has enjoyed the La Brasserie London cocktail menu before, she chose the La Brasserie Martini & Oyster (belvedere, elderflower cordial, chateau bligny champagne, twist of grapefruit, and fresh oyster on the side). Now, here’s where it gets really fun, Sunny friends. La Brasserie lit such a French fire in us, we ordered yet, another round of cocktails. 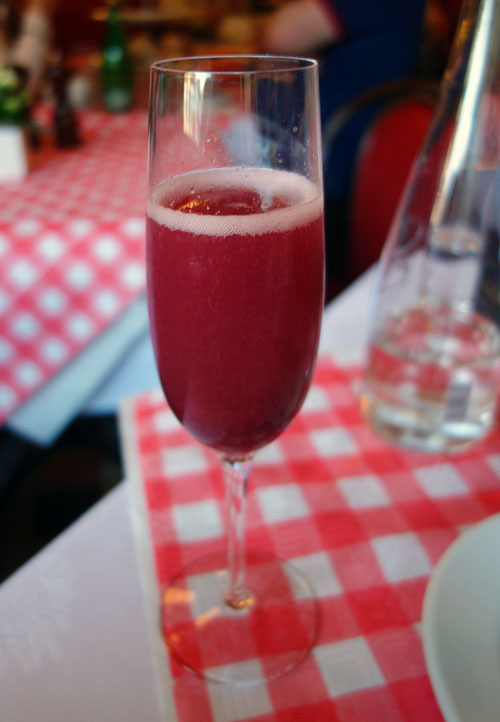 Behold the Raspberry Bellini! Our blogger trifecta lasted nearly fours. 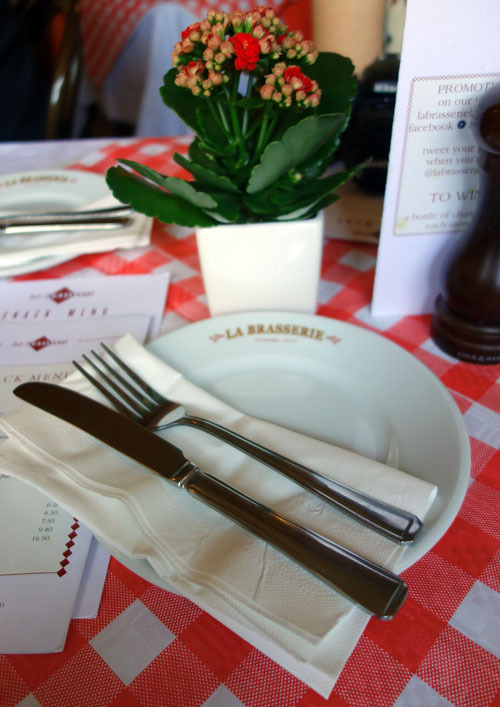 La Brasserie London is just that chic, Sunny friends. Once the sun set, we noticed the tables quickly filling around us and said our tipsy adieus. – I’ll definitely be back to La Brasserie for their divine cocktails. Further, I’m going to check out one of their Cocktail Masterclasses, which is offered every Sunday evening at 7pm. – Mr. 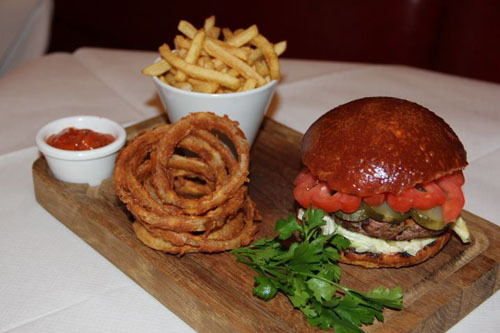 Sunny has heard all about the beef at La Brasserie London and can’t wait to accompany me on a Monday for La Brasserie Burger in a bread-bun night. Seeee…. – I’ll make sure to bring a few female sunshines on a Thursday for Ladies’ Night, where girls receive a cocktail upon arrival. They have AMAZING Easter events, so be sure to watch them! The celebrations will begin at La Brasserie on April 18th. They include an Easter egg hunt and a snail race where the picker of the fastest snail wins a bottle of champagne! Monday 21st will feature raffle prize tickets of epic levels! My meal at La Brasserie was complimentary. All opinions and pictures (unless otherwise credited) are my own. Looks like a really nice venue, I’ve not been there before. 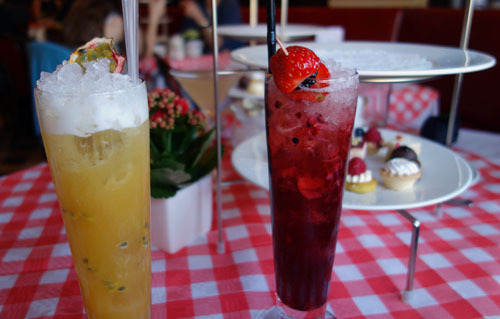 The cocktails look amazing! Looking forward to trying some. Thank you for reading! They were absolutely delicious and truly reflected the upscale style of the brasserie. 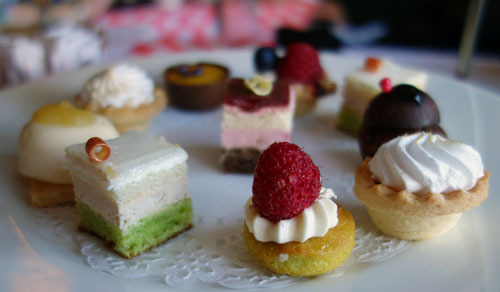 While the tiny pastries and finger sandwiches look yummy, the champagne and cocktails really made my mouth water. What a lovely place to relax and people watch……one of my favorite things to do. Hoorah for Ladies Nights!! Yes, Patty! While everything was great, the cocktails stole the show. I’ll certainly be back for more soon.